Sea level is unaware of the political controversy over the reality of climate change; the sea continues to rise. Many of the world’s shorelines continue to retreat landward, as they have been doing since the great melt-off of the continental glaciers that began about 10,000 years ago. In the short-run experience of human history, or even shorter spans of an observer’s lifetime, we often measure the continuum of the sea’s advance using human structures as reference points. Old lighthouses are classic examples. These structures were built to withstand the rigors of storms, placed in positions where those rigors were known agents of erosion, and at the time of construction, the position of the lighthouse with respect to the shoreline was mapped with precision. Comparisons of today’s shoreline to those recorded on the old maps, with respect to the lighthouse position, show us how far and how fast the shoreline has retreated, or, in some exceptional cases, has accreted. The Morris Island Lighthouse near Charleston, South Carolina, was built in 1876, about 1,300 ft. (370 m.) inland from the water’s edge. 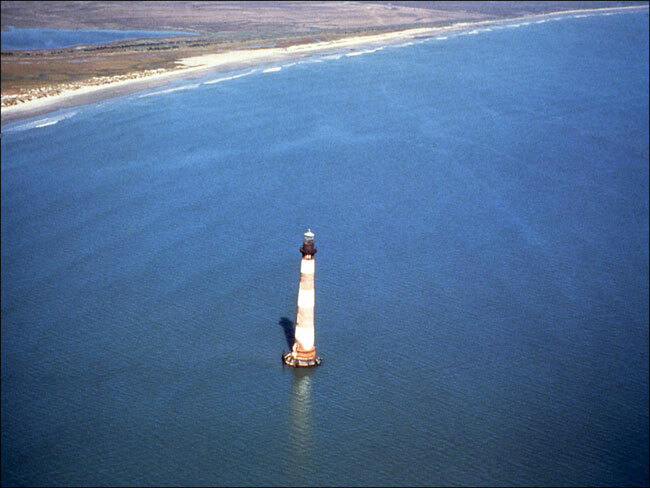 By 1940, it was on the beach, and today the lighthouse sits 2000 ft. (610 m.) on the sea floor offshore in front of the island (figure:Morris Island lighthouse). The island migrated out from under the static lighthouse, in part because of sea-level rise, but the main cause for the island migration was the loss of sand supply to the island due to the construction of the jetties at the entrance to Charleston Harbor in 1889. In contrast, North Carolina’s Bodie Island Lighthouse was originally built in 1872 near the north side of Oregon Inlet. Today the lighthouse stands two miles away from that inlet which has migrated to the south. Had this lighthouse been sited south of Oregon Inlet, it would have fallen into the sea long ago as did its two predecessor light structures. Many lighthouses were built with the expectation that they would someday be lost to the sea. A good example is the Montauk Lighthouse on eastern Long Island, New York. Legend has it that when this structure was built in 1796, George Washington required that it be located far enough back from the bluff edge to last for 200 years. It was built 300 ft. back from the edge of the bluff, and, sure enough, by the 1990s coastal erosion had moved the bluff edge 200 ft. toward the lighthouse. Old mapped water-line surveys from 1838 to 1956 showed an average retreat rate of 1 ft./year, about the distance anticipated 200 years ago. In contrast, the Cape May Lighthouse, New Jersey, is the third such structure, the first two having fallen in to the sea – perhaps reflecting that their builders were not as aware of coastal retreat as was George Washington. In our coastal work over the last four decades we’ve observed another common historic landmark by which to mark the pace of coastal retreat (and sea level rise), namely, cemeteries. Cemetery headstones are marked with dates, and sometimes the burial grounds are noted on maps, again allowing an approximation of how rapidly the shoreline has retreated by inundation and/or erosion. Inundation is often indicated by the presence of a cemetery in a salt marsh, obviously not a place that burials would take place. The cultural tradition of burial is that a cemetery is a place of respect for the dead, and for many, even that it will be there at the end of time. 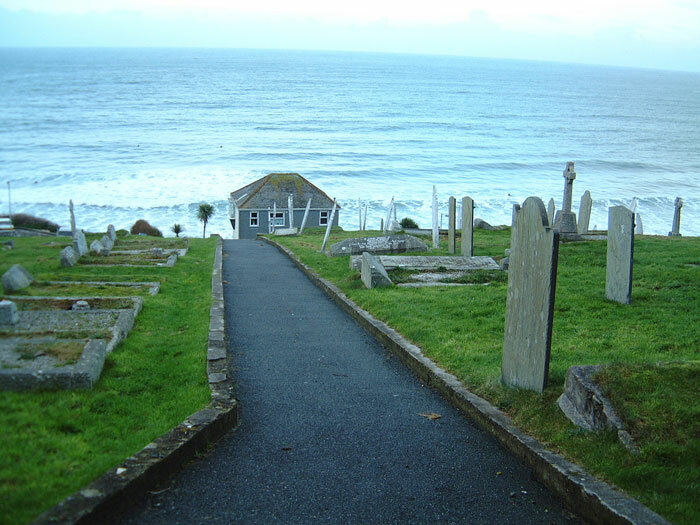 Cemeteries aren’t sited with the expectation that our loved ones’ remains will be falling into the sea! Yet, we have seen numerous examples where this has been the case. Shackleford Bank, North Carolina, now part of the Cape Lookout National Seashore, was once home to the settlers of Diamond City and Wade’s Hammock who, after experiencing 3 powerful hurricanes in 1899, packed up and moved to the mainland at the beginning of the 20th Century, leaving behind three small cemeteries, only one of which remains today. This site is near the eroding back side of the island. One tombstone reads, “Remember Youth when this you see, prepare for death and follow me.” The rejoinder to this once common epitaph is, “To follow you I’d be content, if only I knew which way you went.” Not far to the north, at the ghost town of Portsmouth village on Portsmouth Island, another of the Outer Banks barrier islands, an old cemetery is nearly completely lost. Again, located on the back side of the island, the sea-level rise has flooded what was once dry land from the sound side, and the only evidence of the cemetery is a few remnant stones in the salt marsh. Clearly, this 19th century cemetery was not originally placed in the marsh, so its current location is evidence of sea level rise. The custom of some churches on the Outer Banks of North Carolina is to place headstones with the epitaphs facing the road. For example, the tombstones in the cemetery at Rodanthe, North Carolina, dating from the 1900s to present, face Highway 12, but the older stones face the opposite direction, toward the sound or back side of the island. Apparently, prior to the late 19th century, the road ran along the back side of the island, and the stones faced that road. Then, rising waters eroded that road away, and a new one was built on the seaward side of the cemetery. Since then, the newer headstones have been given the traditional orientation and now face the new road (Hwy 12). Farther north, in Chesapeake Bay, a cemetery was once part of the small town of Broadwater on Hog Island, Virginia, but the small barrier island literally migrated out from under the town. Most of the houses, hotels and even a lighthouse fell into the sea, although a few buildings were moved to the mainland. Years later, fishermen reported catching tombstones in their nets as they trawled over what was once island. Hog Island is but one of Chesapeake Bay’s disappearing islands, once inhabited but abandoned as they were slowly eroded and/or inundated (e.g., Holland’s Island, Sharp’s Island, James Island, Shanks Island, Poplar Island), victims of subsidence and erosion (Los Angeles Times, 23 Oct. 1987: 4). Little is left of Holland’s Island and its coffins have been reported floating out to sea. In 2007, the Washington Post (13 Feb.:A.1) reported that “water is evicting the dead” on the Bay’s Eastern Shore, noting in particular the cemetery being claimed by the eroding bank of Hoopers Island. The article noted 12 burial sites around Chesapeake Bay that were being washed away, or destroyed from below due to rising ground water, often salty, that kills trees which then topple, exposing graves. As a result of storms in 1996, two small cemeteries near Dorchester (Bishops Head) were washed away, resulting in people “progging” (searching the marsh) for “dentures, bones and coffin parts.” In addition, older Indian burial sites are being lost (Press of Atlantic City, NJ, 4 Mar. 2007). The Western Shore of the Bay has similar examples (e.g., Gloucester County, Jenkins Neck, VA: Daily Press, Newport News, VA, 14 Oct. 2006: C2). Reports of floating coffins don’t always indicate erosion. Coffins sometimes virtually float up to the ground surface when inundated by storm surges. On Ocracoke, North Carolina, after a hurricane flooded the island, two coffins (a husband and wife, side by side burial) floated up and were found at the surface of the cemetery after the storm passed by and the flood receded. Chesapeake Bay is somewhat of a geologic anomaly, resulting in the region sinking, so the rate of sea-level rise is 4 to 6 inches greater than the projected global sea-level rise for the century. This subsidence is due to the fact that during the ice age the great ice sheet depressed the lands to the north and caused the Chesapeake Bay region to bulge upward. After the ice retreated, the land to the north rebounded, while to the south, what is now the Bay area readjusted by sinking (isostatic adjustment). Of course, some towns do not pack up and move, but try to hang on in the face of rising sea level and coastal erosion. In some cases, they live in the face of a rising sea level out of necessity – fishermen of the small communities built on the levees of the fingers of deltas that extend into their working environment, like the Mississippi delta. And deltas are in double jeopardy because they contend with both global sea-level rise and even more severe local sea-level rise due to the sinking of the delta caused by natural compaction of delta muds and drilling for water or oil. 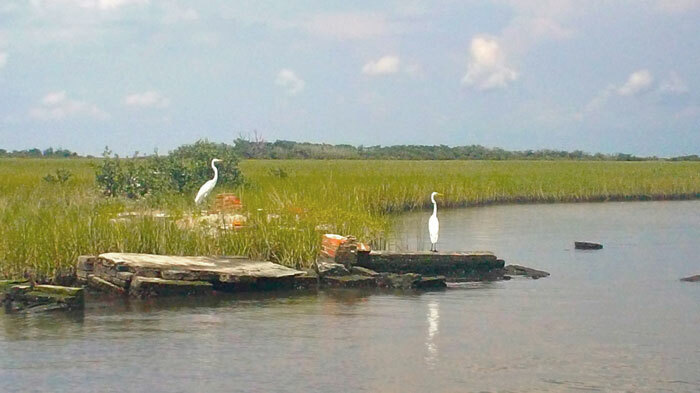 Unfortunately, the existing high ground is not long-lived in the time frame of a community’s history, and sinking turns dry-land cemeteries into flooded wetland marsh or submerged memorials (figure: NOAA photo of graves-marsh-birds). Nevertheless, the local residents can be surprised by this loss of familiar dedicated ground, even knowing that deltas are unstable environments. In late 2012 and early 2013 there was a rash of media reports of cemeteries in south Louisiana being swallowed by the sea. The ABC News website ran photos of crumbling crypts, broken headstones in overwash sand, offshore grave sites, and crypts in marsh land (Louisiana Cemeteries Swallowed by Sea, ABC News). An Associated Press article quoted a resident saying, “We did not bury people in marshes. We buried them on high ground.” (Grand Rapids Press, MI, 6 Jan. 2013: D5).The Montgomery Advertiser, AL (5 Jan. 2013: 3) noted 11 cemeteries in Jefferson Parish repeatedly flooded after Hurricane Katrina, and more than a dozen other cemeteries in Lafourche, Terrebonne, and Plaquemines Parishes have “succumbed to tidal surge.” Caskets float away during flooding and human remains become separated and dispersed. Tree kills by salty ground water cause toppling that adds to the losses. Indeed, the graves dating from the 19th century to more recent times were built on high ground above the marsh and well-back from the shore, but they are now threatened at the water’s edge or falling into ruin in and below water level. The land loss is due to the combination of delta subsidence, global sea level rise, and the loss of protective marshes due to canals dredged in the 1930s that allowed salt water intrusion. Waves and storm surge during hurricanes raise the water levels even more and erode into the cemetery sites (e.g., 7 feet of loss at the Leeville cemetery during Hurricane Isaac, 2012). After Hurricane Isodore, 2002, boaters found coffins floating in the marsh in Terrebonne Parish (The Courier, Houma, LA, 5 Mar. 2012). The ultimate culprit, however, is sea-level rise, magnified by local subsidence and storm erosion. Other cultures also are at the shore by necessity. Alaskan coastal subsistence communities, entire Pacific Islands, and the coastal fishing communities of most continents, especially 3rd world nations, all provide examples of cemeteries going into the sea. In Barrow, Alaska, a burial site (due to an accident) was discovered when a boot containing a skeletal foot appeared on the face of an eroding bluff. The foot turned out to belong to one of 5 family members who were crushed in their Inupiat winter house by a sheet of ice that was pushed ashore by winds. The family became known to archeologists as the Frozen Family See: The Frozen Family of Utqiagvik: The Autopsy Findings). The ice push catastrophe occurred as much as 500 years ago. One of the well-preserved female bodies proved to be a lactating female but no baby was found at the site. Army Corps of Engineers “Alaska Baseline Erosion Assessment” studies indicate that numerous subsistence coastal communities are threatened by coastal retreat, including their cemeteries, an important part of their culture (e.g., St. Paul on one of the Pribilof Islands, Metlakatla on Annette Island, and Ouzinkie on Spruce Island in the Gulf of Alaska, to name a few). 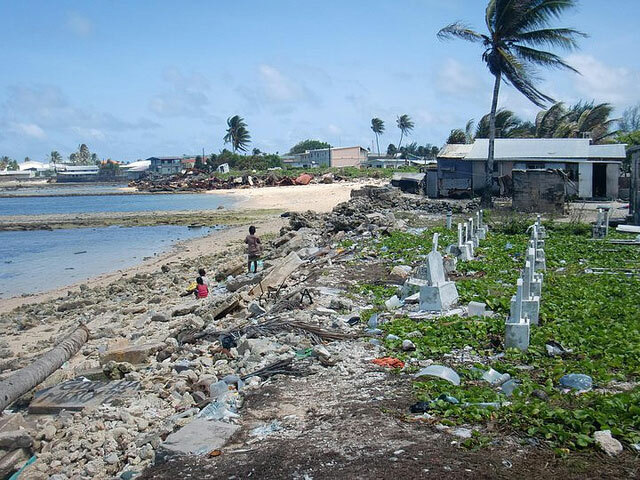 On Majro Atoll, in the community of Majuro in the Marshall Islands at least two cemeteries were toppling into the sea within town limits and no apparent effort was being made to save them (Marshalls, Kiribati, Tuvalu noted in Assoc. Press release, 12 June 2010) (figure: Marshall Islands photo). 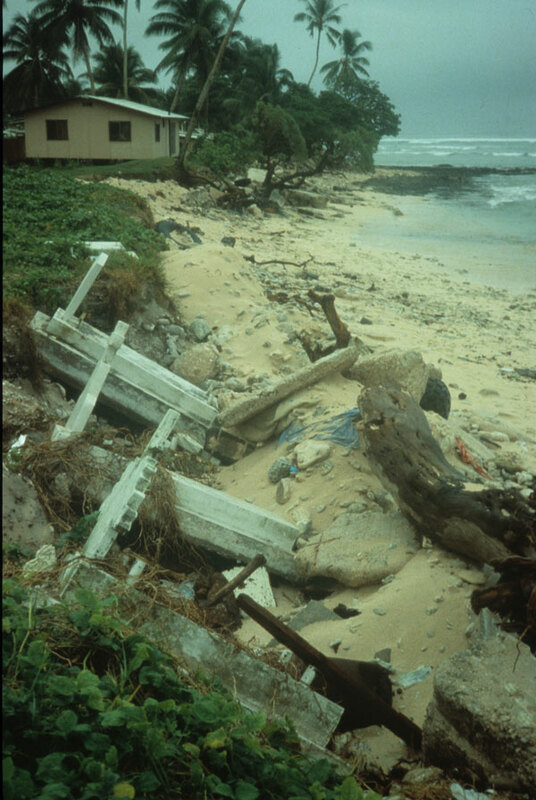 Reports of coastal storm damage to cemeteries on Pacific islands are common news items (e.g., the Independent, London, 10 Jan. 2001; BBC, 25 Dec. 2008). A search of the world-wide web provides ample global examples of cemeteries in or at the edge of the sea. Google any of the following names: Caye Caulker Cemetery, Belize; Cemitério a beira mar, Brazil; Cemitério do Apiques, Brazil; Caherdaniel Cemetery, Abbey Island, Kerry, Ireland; Banjul Cemetery, Gambia, Africa; ; a cemetery on the Ivory Coast of Africa (San Francisco Chronicle, 13 March 1989: B6), or beach front Municipal Cemetery, Lubang, Philippines. Hurricane Wilma, 2005, unearthed coffins from coastal cemeteries in the Bahamas (Palm Beach Post, 1 Nov. 2005: 8A). In Canada, a January 1998 storm exposed bones from the cemetery in Terence Bay, Nova Scotia, worthy of news note because this cemetery is where many of the victims of the SS Atlantic’s sinking were buried in 1873 (McClean’s, 1 June 1998: 70). And by the late 1990s, the sea was claiming graves on the shore of Colac Bay, New Zealand; both more ancient graves but some from the 20th century (Southland Times, Invercargill, NZ, 28 April 1999: 9; 23 June 1999: 5; 1 July 1999: 10). St. Mary’s Graveyard, Whitby Abby, Yorkshire, England (famous as the setting for Bram Stoker’s story of Dracula), at the edge of a crumbling cliff, was receiving attention at least as early as 2000 (Coventry Evening Telegraph, 1 Dec. 2000: 2) when it was reported that gravestones were being moved from the cliff edge and tests were being conducted to determine the slope stability. Boulders were brought in from Scandinavia to ‘protect’ the bottom of the cliff from coastal erosion. But the problem was not solved, and as noted in The Guardian article cited above, bones were coming out of the cliff face as graves were exposed, and in January 2013 another major landslip put more of the cemetery in jeopardy. The continued loss of St. Mary’s graveyard comes as no surprise for the Yorkshire Coast of England. Books have been written documenting the loss of at least 29 coastal towns that once flourished along this coast, but only recently have studies shown that the rate of erosional retreat has accelerated (The Guardian, 24 Sep. 2012). A 14th century account of a once thriving town, Ravenser Odd on the England’s east coast, noted the sea’s destruction of the town chapel and its associated graveyard between 1349 – 1360. Old church records are historical documentation of such losses, for example, Dunwich and its ancient churches have all been lost to the sea, along with cemeteries such as that associated with All Saints Church. The last remaining gravestone fell from the cliff’s edge in the early 1990s. Even more ancient burial grounds around England, Scotland and Wales are being lost to the sea or threatened as archaeologists race to study these sites before they too are erased. 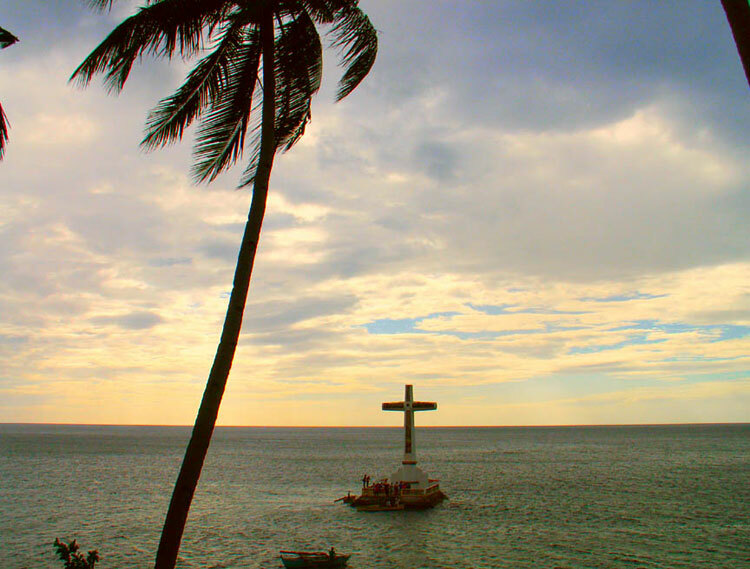 However, we generally do not place the same sense of threat from the rising sea level as measured by losses over hundreds or thousands of years, but the loss of cemeteries that are a century or less old should generate a greater sense of urgency that sea level is rising at a rate that calls for planning a rational retreat. 1. 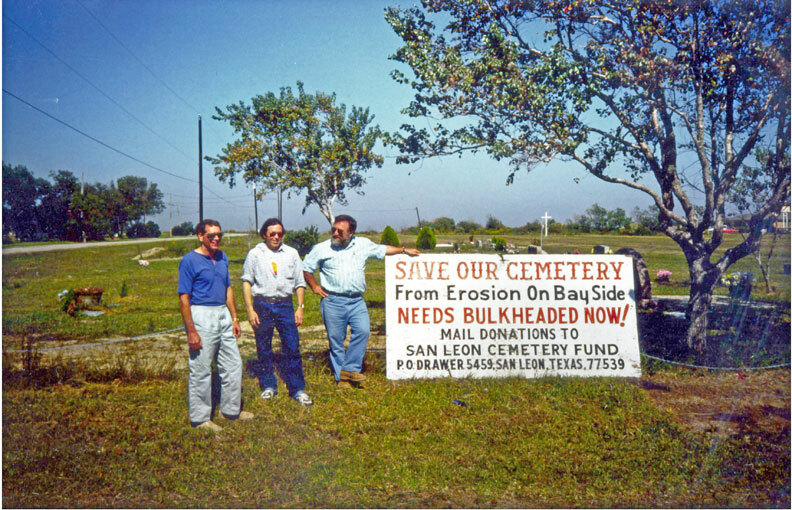 Save Our Cemetery: Along the shores of Galveston Bay, Texas, where sea level rise is particularly rapid due to land subsidence, a church put up a road sign pleading for contributions to a special fund to save their cemetery (figure: Save Our Cemetery banner, Texas). “Save our cemetery” is usually another way of saying “build a sea wall” – thinking that will be a solution. A micro-example is a tiny cemetery on the south end of Daufuskie Isand, South Carolina, where development resulted in properties being threatened by on-going coastal erosion. In response, home owners built seawalls which in turn shifted the erosion points to the ends of the walls. By 2004, there were lawsuits over the structures, and erosion of the bank threatened a cemetery. Around 2005, bones were found along the shore, and consideration was given to moving the cemetery, but it was decided to keep its existing site (McClatchy-Tribune Business News, 17 Aug. 2006: 1; 25 Aug. 2006: 1; 11 Oct. 2006: 1). By 2006, graves were falling in as erosion worsened. Controversy arose over the delay in constructing a seawall, and a year later the delay continued, although a 400-foot rip-rap seawall had been approved (McClatchy-Tribune Business News, 18 Oct. 2007; 8 Nov. 2007). Moving the cemetery would have been more timely, less costly, and a longer term solution. Yet, again and again, shore hardening is seen as the better choice. That previously noted Colac Bay, New Zealand, cemetery was ultimately fronted by a ‘protection work’ but it appears that when a three-meter tide hit at a later date, the wall shifted the erosion point and the coastal road suffered damage (The Southland Times, Invergargill, NZ, 12 July 2000: 12; 21 Aug. 2001: 1). And as previously noted, the imported rip-rap at the base of St. Mary’s cliff in Yorkshire did not stop the cliff-face retreat. Many subsistence villages previously mentioned initially opted for seawalls of various types, but in the end they are still faced with the relocation solution. 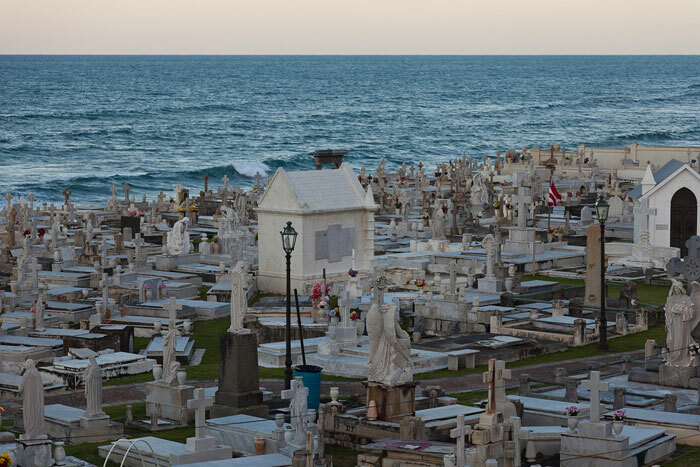 And one of the great ironies we observed was a chunk of man-made rip-rap on the shore of San Juan, Puerto Rico, made up of cemented broken gravestones. That wall too had failed and been replaced by a bigger wall. Similarly, an uncemented pile of tombstones, forming a small revetment, was noted on the landward side of Wrightsville Beach, a North Carolina barrier island. Local opinion concerning the tombstones was that they were thrown out because of misspelled names! 2. Relocate: At Maarup Kirke, on the west coast of Denmark, the grave diggers move graves one-by-one as the sea gnaws away the crumbling cliff (The Independent on Sunday, London, 19 June 2011: 74). The community of Port Heiden on the shore of Bristol Bay, Alaska, has moved two of the settlement’s cemeteries since 1981, according to the USACE. In some cases, the only solution is to move entire villages, including moving the cemetery, or abandonment. But even developed shorelines face this dilemma. At North Cove, Washington, the Pioneer Cemetery was moved after a citizen’s campaign to save the site from loss to coastal erosion. 3. Let Nature take its course: Like the early settlements of the Outer Banks and the island communities of Chesapeake Bay, the cemeteries were left behind when the people resettled to the mainland. Similarly, when small island nations must abandon their disappearing islands there is no real choice other than abandonment of cemeteries. The same is true of all low-lying coastal communities where ‘high ground’ will never be high enough to preserve a cemetery and shore-hardening is folly. The Louisiana delta parishes are learning this lesson, but with a response that has an eye on history and remembering the dead. A regional mapping project has been undertaken by the Louisiana Sea Grant Program to map the locations of all coastal cemeteries, focusing initially on those closest to the water, e.g., Pitre in Cocodrie, Holy Family in Dulac, and Isle de Jean Charles (The Courier, Houma, LA, 8 Mar. 2012). By January 2013, the project had documented 43 sites in 13 of Louisiana’s 16 coastal parishes, including the Cheniere Caminada Cemetery near Grand Isle which holds a mass grave of approximately 700 people killed in the community by the 1893 hurricane — the marsh is now at the edge of this cemetery (HoumaToday.com, 12 Jan. 2013). Historical documentation by this mapping project will be of value to future historians and genealogists and serves as a good model for facing the cultural and economic reality of the global sea-level rise. Similarly, a historic cemetery (1737-1920) that is being lost to erosion on Rainsford Island in Boston Harbor is being studied for conservation by determining erosion rates, flood potential, and using ground penetrating radar (GPR) to identify unmarked grave sites (Gontz, A.M., Maio, C.V., Wagenknecht, E.K., and Berkland, E.P., 2011, Assessing threatened coastal sites: Applications of ground-penetrating radar and geographic information systems: Journal of Cultural Heritage, v. 12, 451-458). Cemeteries by the sea are silent sentinels. Like lighthouses and coastal fortifications, they bear dates of former times when they were on high and dry land. And even if the dead can’t speak, headstones in or on the edge of the sea or in marshes tell a story of the sea’s advance. 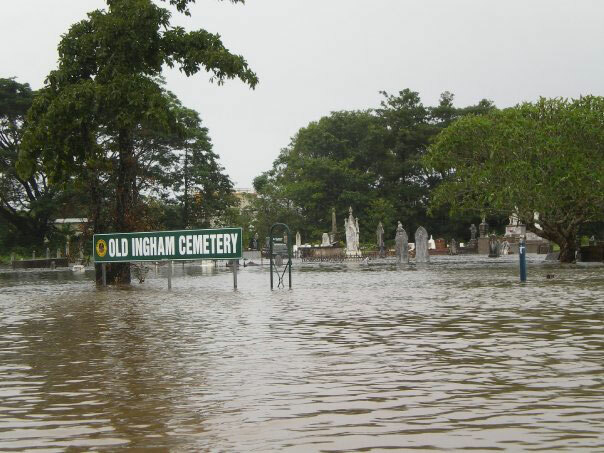 The global pervasiveness of cemeteries going into the sea is evidence of the global sea level rise. Individual graveyards add witness to other processes that have accelerated the local/regional rate of that rise, both natural and man-made. Examples of natural processes include flooding during storms (e.g., storm surge during hurricanes & nor’easters) and tsunamis, subsidence (sinking of deltas, isostacy, earthquakes), and wave attack — the plague of all shorelines affected by sea-level rise. In almost all cases, waves are the erosional agent, inducing shoreline retreat by the beach moving onto former upland, or through the waves undercutting bluffs and cliffs, resulting in gravity-induced landslides and slumps. 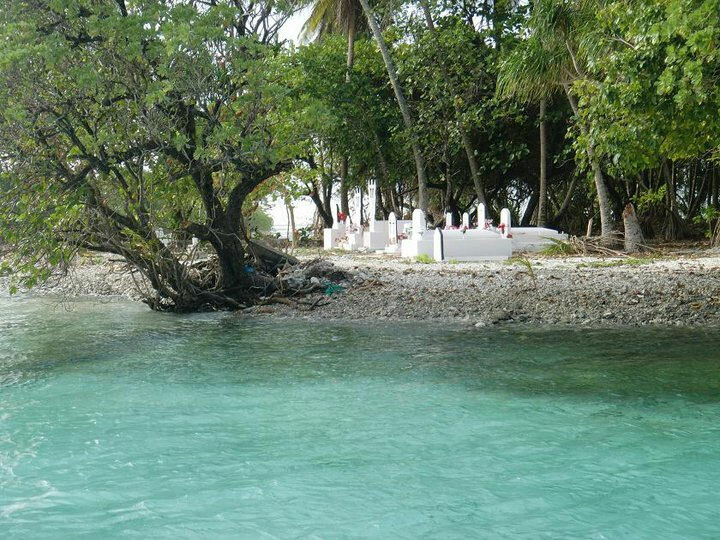 Rising sea level results in a rise in the water table, allowing salt-water intrusion to reach tree roots, causing kills that result in tree blow-downs which can ‘uproot’ graves. 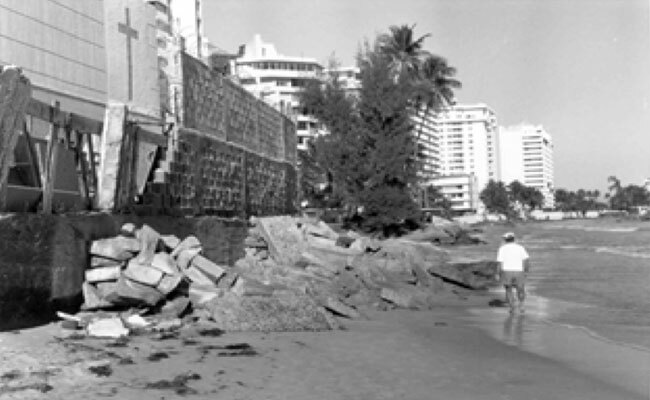 Examples of humans contributing to cemetery losses are mainly from building shore-hardening structures (e.g., seawalls, groynes) that cut off the sediment supply to protective beaches which then erode, exposing adjacent cemeteries. In some instances the erosion may be due to up-drift sand mining, and flooding may be due to dredging of marshes or removal of protective wetlands such as marshes or mangrove stands. That ancient burial grounds have met this fate is not surprising, but the loss of more recent cemeteries or grave sites in the short span of one’s lifetime is another wake-up call that the sea-level rise is real. If the dead could speak, they would tell us that locating a cemetery in a vulnerable coastal location is a poor choice, and trying to hold back the sea is folly. And would they not ask, why do we do the same with buildings?